Derek Ailes is a demented post-apocalyptic science fiction and horror author serving his readers one plateful of horrific terror after another. He is the mastermind behind several horror anthologies including Musings From A Demented Mind and Catfurnado, Zombies and One Killer Doll. 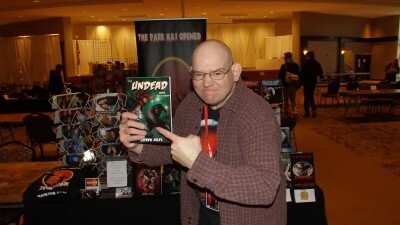 He recently ventured into the vast superhero universe with his first comedy/horror novel The Undead Pool. Derek openly admits that he is a nerd. He reads comic books and graphic novels along with watching every DC and Marvel television series, cartoon, and movie. His favorite series are Deadpool, X-men, The Avengers, Superman, Batman, Flash and The Justice League. Derek resides in the small town of South Haven, Indiana where he cranks out one horrific tale after another. His neighbors both fear and respect him, because they don't know what horror madness he will unleash upon them. He spends his weekends hanging out with horror icons and promoting his work. He is currently working on his latest horror masterpiece. The Ailes Brothers of Terror bring you their first anthology of horror madness. When incredible minds of horror collide, the result is a journey into the unknown. Sixteen tales of horror from spiders, killer cicadas, zombie twisters, cursed relics, witches, black cats, death and more. The Ailes Brothers of Terror will have you on the edge of your seat craving more. If you are a fan of the Twilight Zone and Tales from the Crypt, then this collection of horror terror is for you. Inspired by the movie Jurassic Park, the novel is about a man, Ben Cutler, who wanted to build a zombie park where people could witness real zombies in a safe environment similar to a real zoo. To his surprise, one of the richest men in Indiana backs the project and makes him an instant millionaire. Unbeknownst to him, the military is using the park to develop zombie soldiers to use against the enemies of the United States. Will the zombie soldiers be an effective killing force? What happens if the zombies escape the park? Will the United States and the whole world survive a zombie apocalypse?